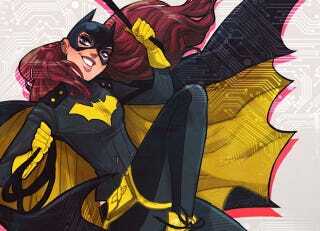 Batgirl is getting a look, a new perspective and a new creative team. It's all good news — especially that fan-favorite illustrator Babs Tarr will making her mainstream comic debut — but none of it better than Barbara Gordon's brand new, utterly fantastic new uniform. Designed by Tarr and writer Cameron Stewart, the outfit is sensible, stylish, and just all around perfect. It also happens to be eminently cosplayable. She's leaving it all behind her. We really wanted to make this a book with a light tone, of fun and adventure and mystery, and let the rest of the Bat-family deal with the darkness. She's got problems, and conflict, and enemies to fight, but our priority was to make this a really fun, rollicking read. Co-writer Brenden Fletcher added their take incorporates "mixes the best elements of 'Veronica Mars' and 'Girls,' with a dash of 'Sherlock' thrown in for good measure." I can't tell you how happy I am to hear this. Not every superhero comic DC puts out needs to compete for the Grimmest n' Grittiest of the Year Awards, and Batgirl's already tragic past made her current miseries even more unpalatable for me. For more details and more art, head over to MTV to read an excellent interview with Tarr, Stewart and Fletcher. And well done, DC. Well done indeed.